While Tom has been online, I’ve been complaining over here in the corner. Only one plug for the internet connection means we can’t stay tuned to the world news simultaneously. I hate being the last to know what’s going on. And it’s a big news day following the earthquake and horrible tsunami in Japan. I was thinking of the Golpe de Estado in Ecuador earlier today. We had no warning for that. In fact, I was expecting a bus strike. But this waiting for the local impact of the far-away earthquake comes with a surreal expectation of living through a moment in history, something everyone will remember. There’s a little thrill: be on the alert. The mood is intensified here because just two weeks ago the country marked the first anniversary of the quake and tsunami in south central Chile. Today, we’re certain of excitement, but also pretty certain of our safety. Local news is local news everywhere. It’s all so… self-centered! Although advised by the Chilean government to walk (no autos!) to 30 meters above sea level, this all remains an overblown exercise in precaution. Even last year’s tsunami didn’t reach the restaurant we just left. We remain fixed on the epicenter, on Japan (via TV, of course), and on all the people directly impacted by the tragedy there. Having warning is a luxury they did not have. 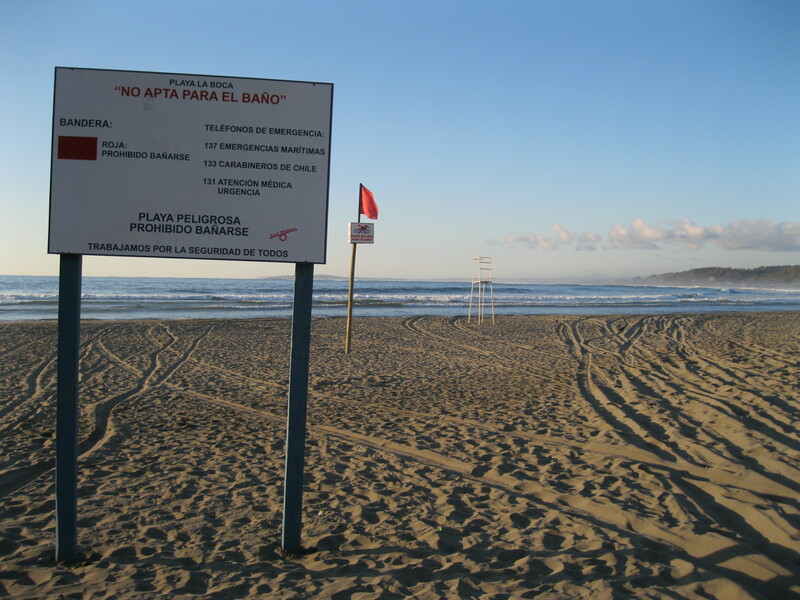 A year ago, the people of Chile, all up and down the coast from Concepción, had no warning. Just last month, after a strong but lesser quake, they needed no warning, and laughed at interview questions suggesting warnings mattered. They knew, like dogs on the beach, to run, to run away. After complaining about the tsunami hitting us at night, when we can’t see what’s going on, I was assured that we would be able to see it, from above, by moonlight. So we’re going to wait around. I don’t want you to think I’m being nonchalant. We are prepared. Note aforementioned bottles of wine. Dinner, check. I took “before” pictures. I unbolted the door. It opens to the uphill side, opposite our deck overlooking the bay. Tom and I arranged a meeting point, across the street and up the stairs to the city hall offices. (But wait, aren’t meeting places in case of fire?) The TV news is repetitive, the hour is getting late, we drift off playing cards or watching NCIS, and…. Tomorrow everyone will laugh as they walk the beach, looking for signs of devastation washed ashore. We walked out to the deck at the appointed hour, and both swore we saw the tsunami roll in. A foot? Less? It wasn’t until the next morning while we sipped our coffee that we suddenly saw the water recede, backing up twice as far as the lowest tide. It held there for a couple minutes, and then just as quickly moved up the shoreline to the highest level we’d seen all week. Witnessing a high and low tide sequence in the course of 10 minutes was a thrill. But the beach equipment that had been so quickly stowed was not replaced. It was the end of the season.